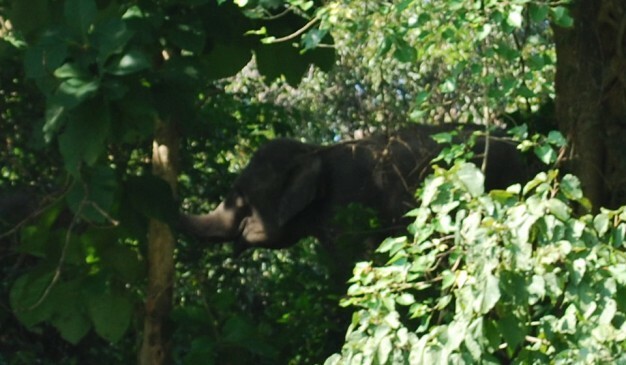 Tucked into the northeast corner of the Chittagong Hill Tracts, the Pablakhali Wildlife Sanctuary is home to elephants and a wide variety of other animals. 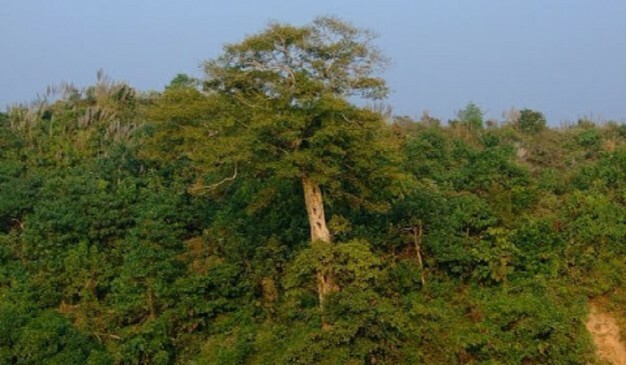 The sanctuary is the finest hill forest remaining in Bangladesh and it also an important wetland site. The Pablakhali Wildlife Sanctuary in Bangladesh is located in the Rangamati District in the Chittagong division. It was established in 1983 so the wildlife and vegetation in the sanctuary is quite settled and well-developed. It is not a very big wildlife sanctuary, as it only covers 420.87 square kilometers, however that does not mean it has nothing to offer. Quite to the contrary, this tiny little sanctuary is positively teaming with life! Some of the animals you can expect to see here include capped langur, hoolock, Asian elephant, rhesus macaque, gibbon, tiger, otters, wild boars, guar, Indian muntjac, Indian python and sambar. Bird lovers can look forward to seeing herons, egrets, little grebe, common coot, common moorhen, waterfowl, white-winged wood duck, Asian openbill stork and more. There are also small cats, dholes and dozens of other animals living in this fascinating wildlife sanctuary. Nature lovers will find that much of this diversity is owing to the regions great topographical diversity. The area is well watered and varies in altitude. The best time to visit the Pablakhali Wildlife Sanctuary in Bangladesh is between November and May. Visitors can choose between bird safaris and jungle safaris and both are equally rewarding. Accommodation can be found in the immediate area by way of two rest houses. You will find that both Bangla and English is spoken here, so most people can find a way to communicate with the locals and tour guides. 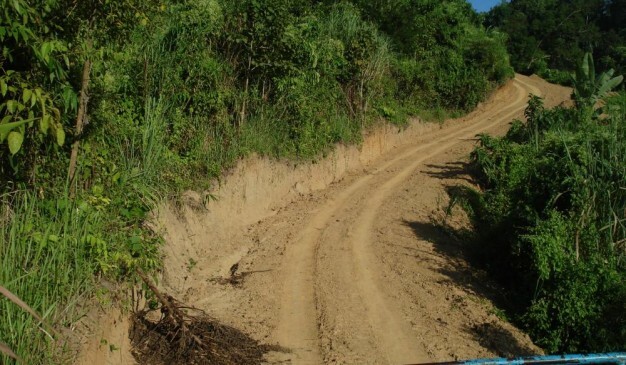 The nearest town is Rangamati which can be easily reached by road or rail. Most visitors will touch down at the Shah Amanat International Airport in Chittagong before taking the train to Rangamati en route to the Pablakhali Wildlife Sanctuary. Whatever way you choose to get there, make sure that you do end up visiting this great wildlife sanctuary! Location: At the northern end of Kaptai Lake in the south-eastern part of Kassalong Reserve Forest in the Chittagong Hill Tracts, some 112 km from Rangamati Town. The western boundary is formed by the Kassalong River. Brief History: It was established as a game sanctuary in June 1962, later declared as Wildlife Sanctuary in 1983. Habita, Flora & Fauna: Three forest types can be distinguished in the sanctuary: tropical wet evergreen forest; tropical Semi-evergreen; and tropical moist deciduous forest. Among larger mammals, the most important is the population of Asian Elephant. Other mammals are Rhesus Macaque, Capped langur, hoolock Gibbon, Dhole, small cats, otters, wild Boar, and Sambar. There are also numerous bird species in the Sanctuary. Different bus services from Dhaka go directly to Rangamati. These buses stop at Rangamati Launch Ghat. From there, board on launches that go directly to Pablakhali (5 hours). You can also use engine boat, but it may pricey (tk 600-700). You can also use Khagrachhari road to reach the sanctuary. That route is Dhaka-Khagrachhari-Marissa-Pablakhali (by boat). There is a beautiful rest house at Pablakhali Wildlife Sanctuary, but prior permission is required from Divisional Forest Officer, Chittagong Hill tract (North). courtesy-Nishorgo. Nuhash Polli was founded in 1997. Initially it covered 22 bigha of land. Now it covers around 40 bigha. Actor Dr. Ejaz helped procure the land. The heavenly 'village' was named after Nuhash, Humayun Ahmed and Gultekin Khan's (his first wife) son. Ahmed was very fond of music. He loved to live amidst nature and relished the date plantation, which he had set up inside Nuhash Polli. 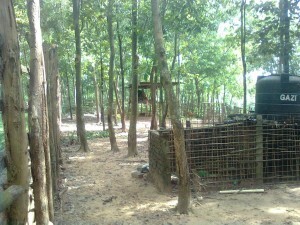 Most paths in Pirozali (পিরুজালী) village, under Mirzapur union of Gazipur Sadar Upazila, are lined with thick Shal (শাল) forest. One path with its beautiful play of light and shadow, welcomes passers-by, leading them towards Nuhash Polli, 25 km from Gazipur Sadar. This was the heaven of Humayun Ahmed, a magician of words, who spent most of his time there after he started directing TV plays and films. Nuhash Polli was open to the public and visitors would traverse great distances to get a view of the picturesque estate. There is a dighi (big pond) at the extreme north end of Nuhash Polli. A wooden bridge has been constructed over the pond. A tent was placed on an artificial island in the middle of the pond. Humayun Ahmed's wife, Meher Afroz Shaon, conceived a daughter who died before seeing the light of day. Ahmed called her Leelaboti, after whom the pond was named. Ahmed also wrote a multi-volume novel called “Leelaboti”. A building called 'Bhutbilash' was constructed adjacent to the pond while Ahmed was receiving treatment in USA. The last time he visited Nuhash Polli, inaugurated 'Bhutbilash', hoping to behold a 'ghost', seated by the veranda of 'Bhutbilash' at midnight. Nuhash Polli houses a large number of sculptures crafted by local sculptor Asaduzzaman Khan. Spectators cannot but be impressed by a sculpture, 'Ma O Shishu' (mother and child) at the entrance to Nuhash Polli. Ghost- shaped and frog-like sculptures have been made to amuse children. A tree house is a delight for children. Ahmed enjoyed rainfall and moonlit nights. He created a room called “Brishti Bilash' from where he could observe the pattering rain. The green yard was always kept clean and tidy to indulge Ahmed's passion for watching the waxing and waning moon. The manager of Nuhash Polli, Bulbul, led a nine-member team in overseeing the overall management of the idyllic locale. Whenever Humayun Ahmed travelled within and outside the country, he would collect various types of trees. About 300 species of medicinal and fruit trees can be found within the precincts of Nuhash Polli. The writer also had a tea plantation at Nuhash Polli, which still exists. Initially, Ahmed accompanied his guests while they wandered through the Nuhash Polli estate. He introduced the visitors to various species and would invite them to taste the leaves of a particular scented tree. A swimming pool stands near the bedroom of the deceased writer. He would swim there at times with his dear ones. Once he swam with noted Indian litterateur Sunil Gangopadhyay. Nuhash Polli was Ahmed's favorite shooting spot for almost all the TV plays and films directed by him. Himchhari Natural Park is just around 5 kilometers apart from the main town. You can reach at that place by any kind of vehicles. To enter the area, you'll need to buy tickets. Which is around 20 taka. There is only two place that you can enjoy at the park, one is the falls, and another one is the top of the hill. 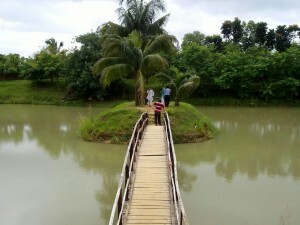 Modhutila Eco Park is at Nalitabari, Sherpur. Modhutila Eco Park is also situated in the border. In the Indian part, Tura hill is situated in the same place. It is in Jhinaigati Thana of Sherpur. It takes 30 mins to reach there from Sherpur. This is a nice place with lots of species of trees and animals. After visiting Gazni, you should visit Modhutila as you go to Sherpur. Visitor can see there Meghlay, plants, animals, waterfall, lake etc. Modhutila Ecopark is unknown tourist place for maximum people of other districts. 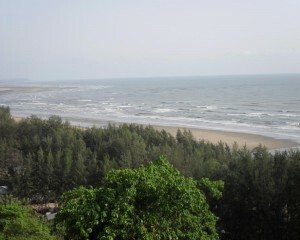 It has outstanding natural beauty and pleasant environment for recreation. My study was based on semi-structured questionnaire survey and informal discussion. Maximum tourist visit this place for pass their leisure period with friends & family. Main attraction of this place is its natural beauty and green environment. This Ecopark is much potential for the development of socioeconomic condition of surrounding people. About 12.5% people of this area are totally depending on this park, and 2/3 people are moderately affected by the park for their income generation. After establishment of this park, percentage of unemployed people decrease from 21%to13%, percentage of poor people decrease from 46%to34% and percentage of education increase from 17% to 21.5% by three years. Park authority faces some problem to manage the park. Communication, security, manpower are the main problem of this park. Sudden attract of Indian elephant is another problem for local people, park authority and it hampered the development of infrastructure of park. If sustained management strategies apply and take effective Government initiatives, then it can play an important role in the development of this area. Natore Children Park is located at the Rajshahi-Bogra Highway, just opposite of Shankar Gobinda Chowdhury Stadium in Natore Sadar Upazila. This park consists of lot of elements. There is a big lake and a bridge over it. The big portion of the park is structured as children’s playground with several manual rides. And the small portion has animals made with clay for children attraction. 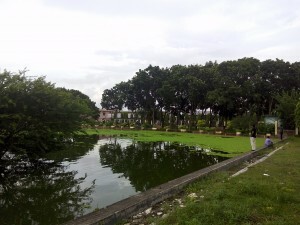 This park was established in the year 2003 by Advocate Ruhul Kuddus Talukdar Dulu, the then Deputy Minister of Land. The main reason behind building the park is to gather the general people of the locality for entertainment in various occasions. Also, because of not having available children playground, this was built to enhance their childhood, although people of all ages gather here every day. Throughout the park, there are lots of seating arrangements. Usually every afternoon, people come here with their friends and family members to enjoy their leisure time. Also in any occasions, this park is being decorated for enlarging the tourist attraction. Modhutila Eco Park is at Nalitabari, Sherpur….